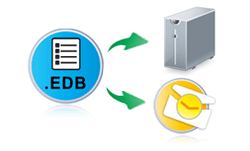 EDB File Repair – Setting the Stage for Accuracy! Diminishing the chances of any drop offs and decreasing any risks of fallbacks, our Exchange Recovery solution keeps you rest assured that recovery will happen your way and will definitely bear good results with the EDB repair process. Given the chance to repair EDB file at your end, this EDB repair tool will work its best way to give you the best possible results with the process to repair Exchange database. Downtimes can be nerve-wracking, and so does the corruption in your Exchange database EDB that contains all users' mailboxes collectively in a single storage hub. The maiden years with any email setup go pretty fine, but when a considerable amount of time passes away and you are still sticking to the same email system, then problems like storage space issue and bulky files crop in for sure, and you have no other way than to delete some obsolete stuff or instructing your users to keep doing that on a regular basis. However, in the absence of this protocol to protect data corruption due to oversizing of file, you can encounter the corruption scene pretty fast, just as the file crosses its upper limit of data saving. Disliking the Exchange email system altogether is no solution as it can happen with any email system whatsoever you might use. The thing here is that how you solve the problem faced now and how you deal with the whole issue that demands to repair corrupt Exchange mailbox. What we suggest you here and also what most of other experts will suggest you the same is that you must use a third-party tool for EDB file repair process. Let that smile come to your face as we are giving you just the same! Even if your EDB file had been encrypted and you now want to recover data from it, then you can very well do it with the help of our tool. Password protected EDB file can also be worked upon for EDB file repair process and this password protection won’t obstruct the recovery in any way so go ahead with repair Exchange mailbox process. Repair entire EDB files such as, repair pub1 edb, repair priv1.edb process even up to Tera-bytes data is possible with our tool. End-to-end EDB repair, repair STM file and conversion of data from EDB to PST, so you will be getting all your emails, contacts, data, tasks information, to do jobs detailing, calendar schedules, recurrence, notes, journals and all the rest of the stuff from Exchange database into a PST file cover. The Demo trial model is a free facility to Repair Exchange Database, free for all! Use it and avail it to test the tool before you think of investing your hard-earned money into it. Believe you me, it is going to be a great deal to repair Exchange EDB file and you will get a good value of your invested money. You will surely like your decision about investing into this particular tool for sure.